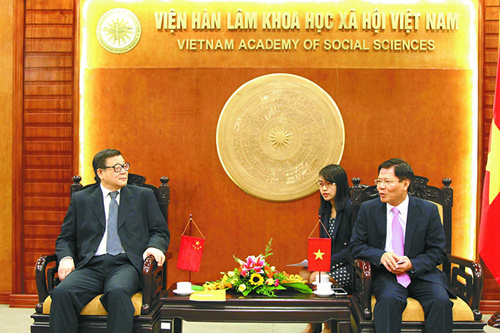 Chinese President Xi Jinping and Nguyen Phu Trong, general secretary of the Communist Party of Vietnam Central Committee witnessed the signing of a cooperation agreement on academic exchanges between Chinese Academy of Social Sciences (CASS) and Vietnam Academy of Social Sciences (VASS) on Nov. 12. Signed by CASS President Wang Weiguang and VASS President Nguyen Quang Thuan, the agreement encourages research cooperation, exchange visit between scholars, joint symposiums and fostering young scholars. Cooperation agreement on academic exchanges between the two academies started in 1993. In the past two decades, fruitful achievements have been made under the framework of the agreement. Both at the crucial stage of reform and development, the two countries are facing precious historical opportunity in national development and further improving bilateral relations. This new cooperation agreement will provide intellectual support for deepening comprehensive strategic cooperative partnership between the two nations.